Beautiful hostas! These plants are a landscape staple with so many brilliant varieties and sizes. They can fit into, beautify and complete your yard. Hostas are a great perennial choice for Michigan and can be divided regularly to beautify many areas of your yard. 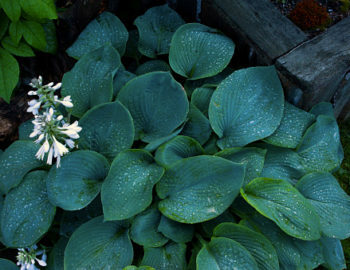 Hostas perform best when planted with ferns or other perennials in prepared beds. They can also be tucked into the landscape on a hole by hole basis if an area of at least 2–3 feet wide is prepared to a depth of 9–12 inches. They also shine when planted in woods with wildflowers. One reason hostas are such a favorite of so many Michiganders is that they can be successfully planted any time that the ground can be worked, although the best time to plant hostas is when they are actively making new roots — like right now! We see small hostas regularly used as border plants. Long rows of ‘Golden Tiara’, ‘Gold Edger’, and ‘Kabitan’ are wonderful varieties for a landscape border effect, defining space as well as carrying the eye around the garden. There is one problem with hosta around these parts…deer! Many of us have looked lovingly on our beautiful lush hostas only to find the next day nothing but a bunch of chewed-off stems! There are a number of repellant products available to buy or you can try a more natural approach. Many report successful deer defense by sprinkling leaves with black or red pepper, garlic or curry powder, or piling rocks around the hosta (apparently deer dislike walking on rocks). We’ve also heard of shredding Irish Spring soap and placing that around your hostas. There are no guarantees, but we think the risk is worth the reward when it comes to hostas!